The OCU Community thanks you for respecting and observing a policy that will create a healthier learning and working environment. Under the policy beginning May 18th 2008, and revised February 1, 2014 tobacco use will be prohibited both indoors and outdoors, including all common areas, building entrances, athletic fields, sidewalks, and parking lots. In light of mounting research including the latest U.S. Surgeon-General’s report, “The Health Consequences of Involuntary Exposure to Tobacco Smoke,” which concludes that there is no risk-free level of exposure to secondhand smoke, it is time to take the next step, of making OCU completely tobacco-free. The OCU Tobacco-Free Campus policy enables students, faculty, staff, and visitors to preserve their health by providing an environment where people can learn teach and work free from risks associated with tobacco use. A tobacco-free environment will provide the following benefits to OCU students and the entire campus community. Supports community efforts to reduce or eliminate tobacco use in public settings. Eliminates second-hand smoke from around building entrances and sidewalks. Eliminates litter from cigarette butts and other debris. May encourage some tobacco users to stop a harmful habit. 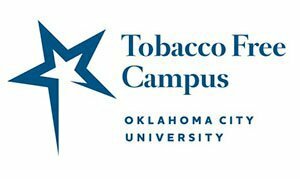 Prepares OCU students to cope with future employment in tobacco-free environments. Reduces risk of fires caused by cigarette smoking. Increase the likelihood that non-smoking individuals will remain non-smoking. Effective Date: OCU became a tobacco free campus policy on May 18, 2008. Revisions to the policy were implemented on February 1, 2014. Background: The policy change was requested by students and employees, and has the support of Student Senate and the Deans’ Council. It is also in line with the social principles of the United Methodist Church. We cannot ignore the preponderance of evidence that tobacco use is a threat to everyone's health, smokers and non-smokers alike. We have visitors to campus, young and old, whose illnesses can be worsened by exposure to smoke. We have children participating in outreach programs and prospective students and parents visiting campus. They need to see healthy habits modeled. OCU has a responsibility and duty to promote health among students, employees, and visitors on our campus. In the face of overwhelmingly clear evidence of the dangers of tobacco use, adopting a tobacco-free policy on our campus demonstrates that OCU is a place where we value knowledge gained through study and where we support translating research into practice.